During the first week of October 2014, Carina traveled to north Italy, having been invited by the organisers of Swim The Island – Italy’s largest open water swimming event with over 1200 entrants, and one of the biggest in Europe – to appear as special international participant. The event offers three distances – 1.8km, 3.5km and 6km, and Carina decided to attempt a 3-way of the longest distance (i.e. a total distance of 18km) to raise awareness and funds for the Little Fighters Cancer Trust (LFCT), making this another unique Swim For Hope. During the race briefing on the night of the 4th of October, Carina addressed the swimmers and organisers, sharing information and the drive behind Swim For Hope. Here she shared a platform with race organiser Matteo Testa, founder of Ocean Recovery Alliance Doug Woodring, and other international speakers. She also gave a musical performance on the night. On race day (5 October), she started her swim at 09:20, before the mass racing was set off. 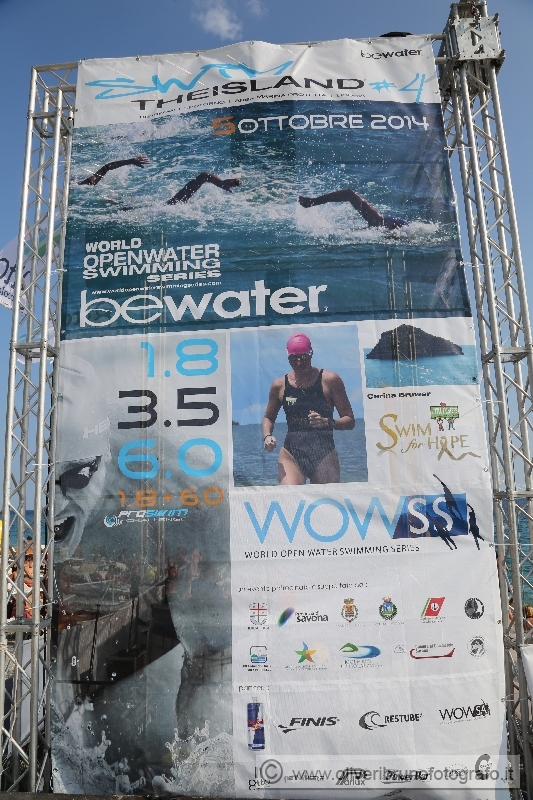 The end of her second lap signalled the start of the 6km race in which 400 swimmers joined her in the water. Carina finished her 18km Swim for Hope in a time of 5h08. “18km is the furthest I’ve swum since 2006, so I had to dig deep, but it was a wonderful swim and a fantastic experience, and I’m happy with my time and ready to go further for LFCT”. DONATIONS CAN STILL BE MADE TOWARDS SWIM FOR HOPE, FOR THE LITTLE FIGHTERS CANCER TRUST, PLEASE CLICK ON THE DONATE BUTTON BELOW.